Looking for something better than a generic give away promotional check presenter to present you bill in? Customize our quality PU leather billfold (with your logo) it two durable pockets on the left and right to hold the bill and credit card. We make it from durable leatherette (PU leather) and stitch it in either black and white for added durability and strength. This quality billfold check presenter is a must for all restaurants bars or restaurants. SKU: PU billfold. 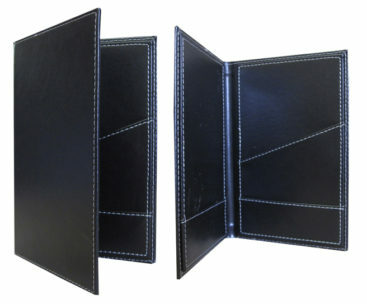 Category: Custom Leather Billfolds. Tag: homepage.